This month I am going to showcase one of the easiest transformations of our former dwelling... The kitchen/dining room area. One of 3 areas in the entire house (the other two were bathrooms) we didn't have to completely rip up the flooring and start fresh. This post will really drive home the point that a little paint goes a LONG WAY. 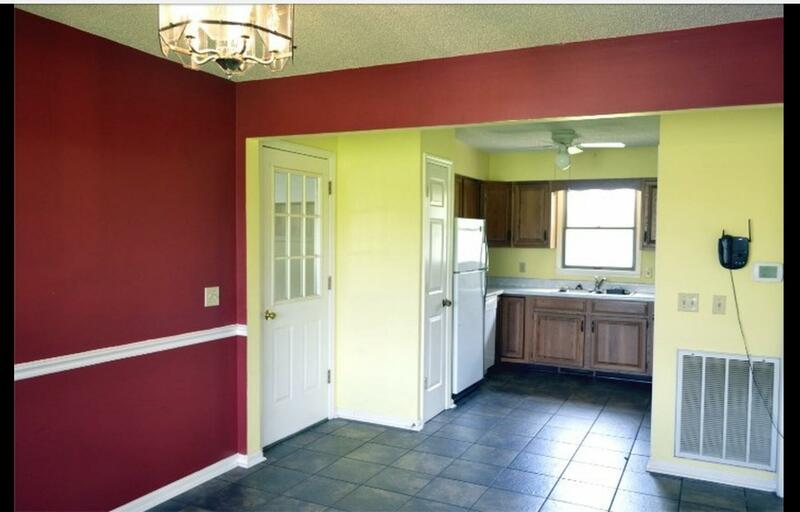 Exhibit A: a two color nightmare with hideous light fixtures. Yes, there was a ceiling fan in the kitchen! We liked the tile and existing cabinets, but several other finishes needed to be updated. Our list included replacing light fixtures & refrigerator, closing up doorway into den, and PAINT. For light fixtures we went with Edison bulb and clear glass to help open the space up a little. We decided early on that two different colors (especially one dark) in this small space didn’t do the size any justice. We chose a light and cheerful color that would accommodate both areas nicely. Close up the doorway to den. Check. New paint & ceiling fan replaced. Check. Total estimated cost is right around $310 for this project. I would say not too shabby for a total face-lift. Again, you know how much I love “Before & After” photos so here is when we bought it vs. the day we moved out. As always, thank you so much for stopping by my little corner of the world. I hope this has inspired you to spruce up a space of your own and realize you can always change a space on any budget. If you have any questions or comments feel free to shoot me a message.